During the summer of 2013, I had the honour of being invited by Torus Power to tour its manufacturing facility located in Toronto, Ontario. Torus Power specializes in Power Transformers designed to achieve the highest quality of audio and video in all systems by eliminating noise and interference from untreated AC power. The company offers a wide range of products for consumer applications, new construction and studio environments. The tour was spearheaded by the company’s CEO / President himself, Howard Gladstone. Torus Power has now been in business for 7 years, with its products manufactured by Plitron Manufacturing Inc., the maker of toroidal power products for over 30 years. All Torus Power products are designed and hand crafted in Canada. So why should you consider integrating a quality power transformer into your audio or video system? Power delivery is the most overlooked aspect in most systems. Most people assume that the electrical current coming from the power plant to their home is a pure, clean, 110V/60Hz at any given time. But this is far from the truth. The voltage often fluctuates, and the lines suffer from Electro Magnetic Interference (EMI) and Radio Frequency Interfere (RFI). Then there are also distortions generated by other equipment, from the lowly cell-phone charger to the HVAC system in your home. Feeding this polluted power to our components can seriously deteriorate the quality of the sound and picture in our system. Therefore it is always better to use a capable power transformer in your system and this is where Torus Power products come in. I have to admit although I’ve never personally used a Torus Power product, I’ve been suggesting the products to AV enthusiasts for the last 3 years or so due to their logical, no hocus-pocus approach to the power filtering system. 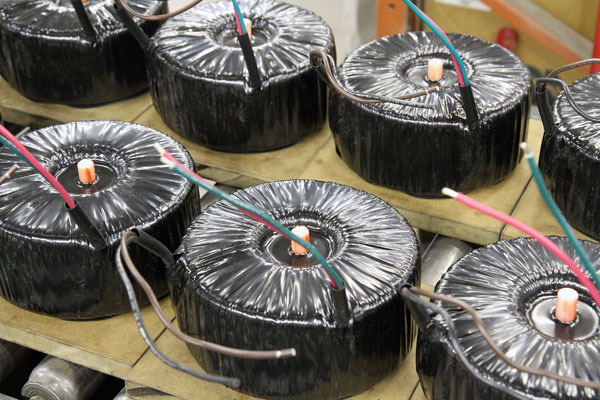 To the best of my knowledge, Torus Power is the only company that exclusively uses a gigantic custom-designed Toroidal Isolation transformer at the heart of its Power Transformers. Other manufacturers whose products I have tested, use various capacitors and a whole slew of tiny-sized components to do the filtering. Many even use AC to DC and back to AC conversion which, although in theory can produce clean power, won’t have enough reserve power needed for transient moments required by audio components, especially amplifiers. Furthermore, all Torus Power systems isolate components plugged into them from the power grid thanks to the fact that they employ Toroidal Isolation. Using Narrow Bandwidth Technology, these units also act as low pass filters, attenuating noise-prone frequencies, thereby eliminating undesirable buzzing and humming. By offering low output impedance and custom designed transformers, they can provide greater dynamics and continuous flow of power to the components plugged into them. As you might expect, Torus Power also includes a Series Mode Surge Suppression in its higher-end models which are completely non-sacrificial. This is unlike regular MOVs utilized in other power protection products which absorb the surge and bleed it to the load gradually, to avoid potential ground contamination. They even meet the stringent IEEE endurance standard of 6,000V / 3,000A after 1,000 repeats. MOV-based products on the other hand are sacrificial and can only protect your connected components once and then they have to be replaced. 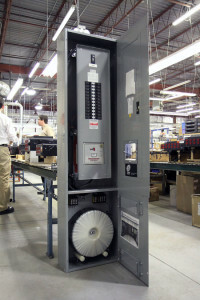 For us who live in areas where power sags happen 10-20 times a day (pretty much everywhere in North America), the Torus Power AVR series include Automatic Voltage Regulation which accepts voltage anywhere from 85V to 135V and boosts or clamps it as necessary to output a safe operating voltage between 115V and 125V. 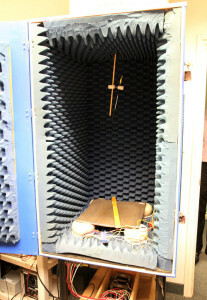 Visiting the test lab where the custom toroidal transformer was created, I was shown an anechoic chamber where the mechanical noise of the toroidal transformer is measured (see Picture 1). For an A/V system, the noise level of the transformer is as low as NC10, which is virtually inaudible considering even my very-quiet dedicated home theatre is rated at NC40 (as per the THX standard) which means anything below NC40 is inaudible. Impressive indeed. 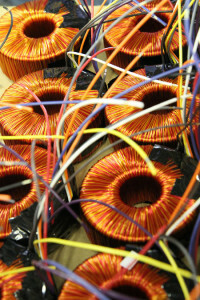 Following the tour of the lab, I was taken to the area where the toroidal transformers are made. 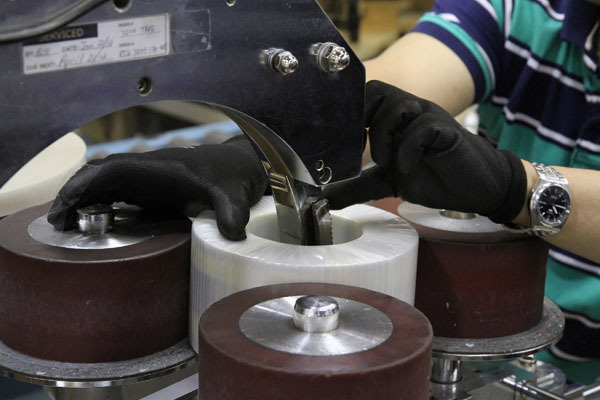 Here I witnessed the manufacturing process which starts out with the solid core (Picture 2), that is then hand-wound (Picture 3), and isolated between the windings (Picture 4). The final product is shown in Picture 5. These particular transformers were destined for Bryston power amplifiers. Using the same process but on a much larger scale, Plitron Manufacturing creates the transformers for the Torus Power line-up of Power Transformers as seen in Picture 6. If this doesn’t impress you, take a look at the all-in-one floor standing product shown in Picture 7, usually used in studio applications. And if this wasn’t enough, the company also offers a Floor Mount System that weighs upwards of 730 lbs with a power rating of 35 kVA. I’ve been an adamant backer of clean power for many years because of my background in music production. In the studio, we used mostly low-level inputs that needed to be boosted significantly in order to be recorded. The microphones, for example, need to be powered with 48V Phantom Power, then boosted with a tube-based pre-amp and then dynamically compressed by a minimum of 8:1 ratio. This process not only boosted the sound coming into the microphones, but also any hum and buzz. Multiply this with numerous inputs, and if you don’t have clean power to begin with, you’ll end up with a nasty recording. shared outlets versus the dedicated filtered outlets, the difference is very revealing. There is no hum, hiss or buzz even when pushing the output to the absolute maximum, unless I put my ears literally next to the speakers. Music sounds extremely clean and video looks crystal clear. Following my tour of Torus Power, I was offered to try out the Torus Power AVR 20 power transformer ($5,000) in my own home theatre. The AVR series of Power Transformers offers 15 and 20 amp models, the AVR 20 I took home is the 20 amp version. All AVR models provide clean AC power, noise filtration, voltage regulation, series mode surge suppression, high instantaneous current capability and input current limiting. At the core of the AVR 20 is a massive toroidal transformer, housed inside a heavy gauge steel and aluminium chassis. All the power inlets and outlet receptacles are audiophile-grade. The front of the unit sports an LCD display which shows the input and output voltage and a blue-backlit power switch. To learn more technical details about the AVR series, I urge you to check out the product page on the Torus Power website. I was very curious to investigate the impact the AVR 20 would have on the sound and picture in my environment. After all, as mentioned above, I’m already using dedicated lines and hospital-grade Power Transformers in my system. The power transformer is heavy-as-an-elephant (95 lbs) and I found myself taking multiple breaks as I carried it from the car to my home theatre room. Take a look at the two pictures of the internals of the AVR series – these devices are impressively massive and house a 16 inch toroidal transformer. Luckily the fruits of my labour were quickly evident. I plugged in all my gear into the power transformer and heard something that I’ve never heard before in my system. With all of my components powered on, there was a complete silence emanating from the speakers. I couldn’t hear anything even when I put my ears next to any of the speakers. Nothing… nothing at all. The background sound was completely pitch black, I’m not exaggerating. Given the steps I had already taken in my home theatre to ensure clean power delivery, I did not expect the AVR 20 to make nearly this much of an improvement. What astounds me even more is that I was always somewhat dissatisfied with the lack of dynamic power delivery from my AV receivers, both the Pioneer Elite SC-25 and the Anthem MRX-700. Not that they sound bad; in fact they sound mighty good, but I always found that the transients are not quite fast enough and I always attributed this to using the receivers’ internal amplifiers, rather than using a separate power amplifier. Now to be honest, I couldn’t see any visual differences in the video performance between my current filtered setup compared to the Torus Power filtered setup. But without question, the sonic differences were tremendous. For example, the continuous bass-drum kick in “Terminator 2″ on Blu-ray felt tighter and a lot more taut. Likewise, the punishing ‘Pour Some Sugar On Me’ scene from the “Rock of Ages” Blu-ray that normally puts my receivers’ amps out of breath was reproduced with all its glory, with great energy and dynamics. In addition to the sonic improvements, I also had the opportunity to compare the electrical signal inside my house (using an oscilloscope lent to me by Plitron Manufacturing), before and after adding the AVR 20 into my home theatre system. Graph A shows the electrical signal without any filtration. Graph B shows the signal in my home theatre using my current filtered setup. Finally, Graph C shows the filtered signal offered by the AVR 20 power transformer from Torus. Even when comparing Graph B and C you can see a huge difference in the cleanness of the power from my hospital-grade power transformer versus the Torus Power transformer. This of course only solidifies the audible improvements that I heard during my listening tests. If you strive to achieve nothing by the very best performance in your audio or home theatre system, I strongly suggest taking a look at the Torus Power range of products. 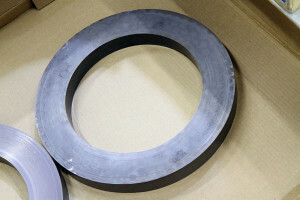 For more information about Torus Power products, please check out www.toruspower.com.